Services range from full engine builds to whatever specification the customer requires, clutch and brake replacements, gearbox and full drive train repairs. 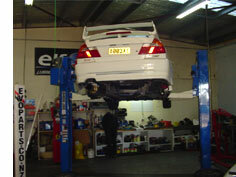 Evoparts can also carry out all your routine vehicle servicing and arrange for your W.O.F inspection. With extensive experience working on Mitsubishi Evos, Jeremy is the man to see in regards your prized Lancer Evolutions and can offer practical advice on the best and most cost effective methods of repairing or preparing your car. With a ready supply of parts on hand nothing is a problem to fix and repairs can usually be sorted very promptly due to the parts being available ex stock. Evoparts can also cater to non Mitsubishi vehicles and are happy to repair your vehicle in their fully equipped workshop. They are an authorised repairer for several warranty companies, including Autosure and DriveRight. This means that they can carry out your repair from claim to completion. Need an oil change? Evoparts are proud stockists of ELF Lubricants and have tested the range of oils in tough and demanding rally competitions and have been very happy with the results. There is a full range of oils available for engine and drive train requirements and Jeremy is happy to advise you on the best oil for your application. So the next time you are thinking of servicing or repairing your vehicle think evoparts mechanical services and give Evoparts a call on 03 365 4404 or email us.